I was working on a *Wedding Branding* board to show the visual for our new clients’ Jaime and Keith’s custom wedding invitations and stationery. I am so grateful Jaime approved to share with you! I am in LOVE with the Rose Gold. Their custom invitations will have hand-painted border to match the bridge in Central Park where Keith proposed to Jaime. The circular border design will be hand-painted in metallic rose gold paint on EACH invite. So very romantic! 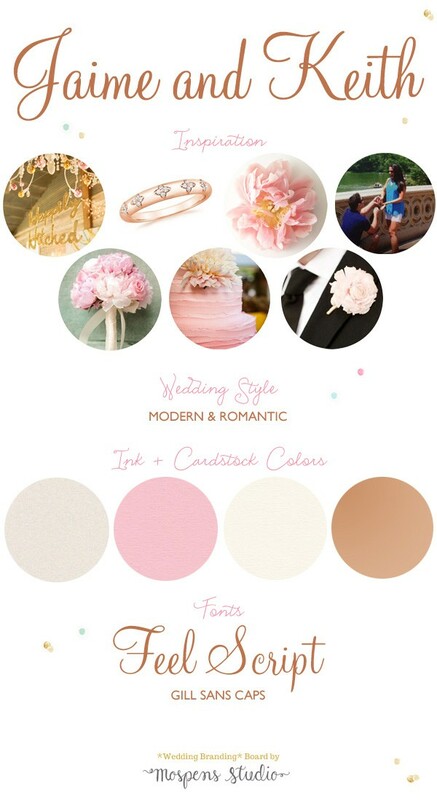 Blush pink, cream, and quartz metallic cardstocks make up the cards. The handmade envelopes will be lined with custom watercolor peony floral art. LOVE! Sources: 1 /2 / 3 / other photos shared, no reference to source.